When you need an affordable handheld microphone for singing or public speaking, it's hard to beat the value in the Shure PGA48 dynamic mic. The PGA48 is a sturdy microphone that captures clear, intelligible vocals and speech and is ready to plug in to any sound system or recording device with standard XLR microphone inputs. Musicians and engineers at Sweetwater have turned to Shure microphones for decades, because they work well and are built to last. 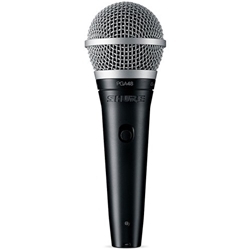 From public speaking to karaoke, you can count on the Shure PGA48 handheld dynamic microphone.